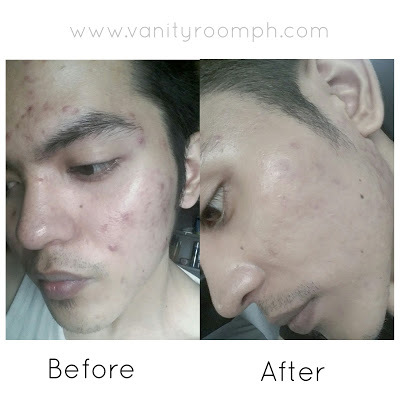 In my Relumins Professional Acne Clear Trio review, I've mentioned there that I'm using a whitening cream with sunscreen to help lighten my dark spots. I seriously braved myself to use the product along with the said Acne Set mainly because the cream has a sunscreen to protect my face while it's in the healing process. 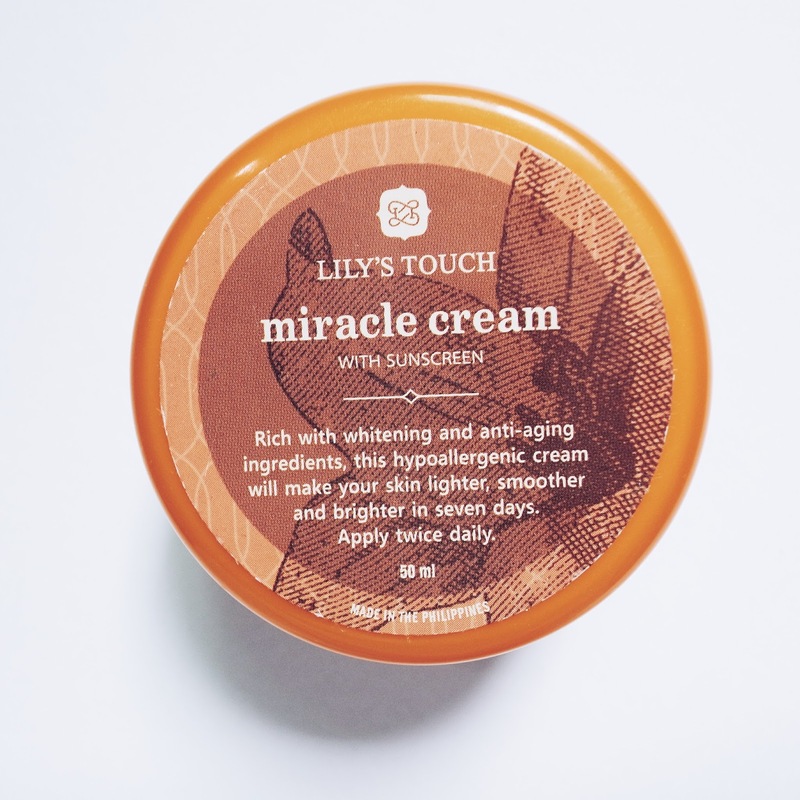 Lily's Touch Miracle Cream is rich with whitening and anti-aging ingredients, this hypoallergenic cream will make your skin lighter, smoother, and brighter in seven days. 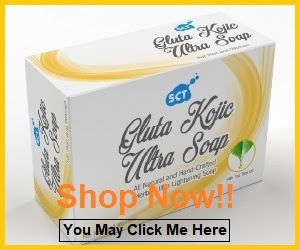 Kojic acid, Zinc oxide, Titanium dioxide, Alpha Tocopherol ( Vit.E), Sunflower oil, Emu oil, Whitening plant extracts. 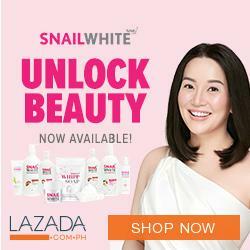 I was seeing this miracle cream on my social media feeds being endorsed by some celebrities and I seriously ignored it a thousand times because I thought it was just over promoted. As I've said, I decided to use it as a sunscreen without expecting it to help me get rid of dark spots. 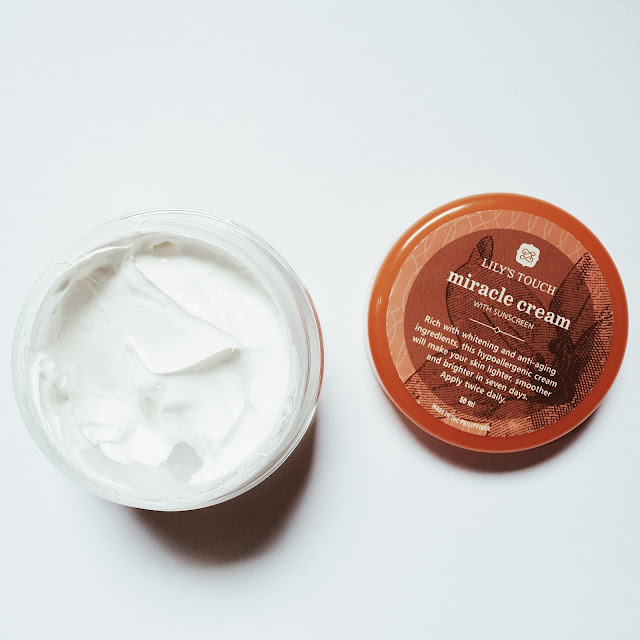 I've been using Lily's Touch Miracle Cream for more than a month now and I must say that I'm enjoying using the product because it really helps in fading my dark spots plus a few dots on my face will go a long way. You don't actually need to put on too much product to see its effect. What I'm doing is I'm putting four dots on my face (forehead, chin, and cheeks) and spread it evenly. It has a sweet melon smell that will surely bring back the child within you because it literally smells like a melon candy. I'm using the product once a day (After my morning bath) and I think the 50ml tub will last for more than two months because it's really matipid. After reading the ingredients for the second time, I've found out that it contains kojic acid (that's why it lightens) but, but, but! The product is hypoallergenic so you don't have to worry about irritation. I have a very sensitive skin and I'm a living proof that it don't irritate skin. To summarize everything, here are the things that I like and I don't like about Lily's Touch Miracle Cream. 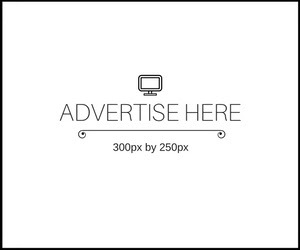 All in all, I must say that the product is really effective and true to its claims. 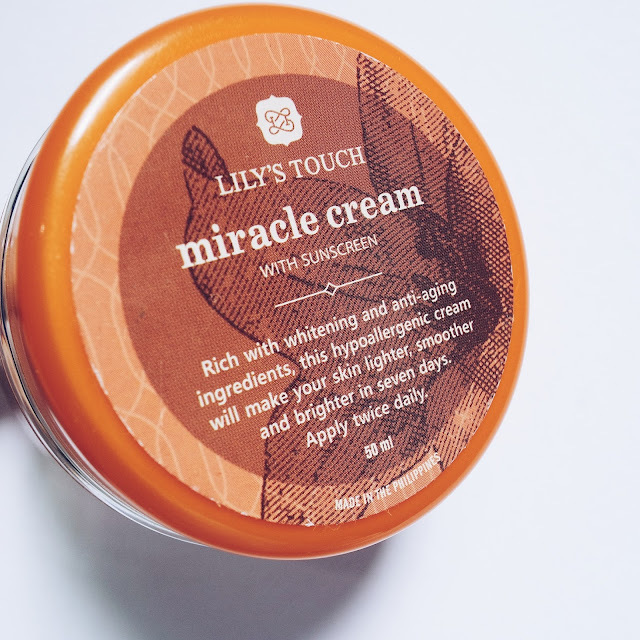 I recommend Lily's Touch Miracle Cream if you are looking for a hypoallergenic whitening cream.